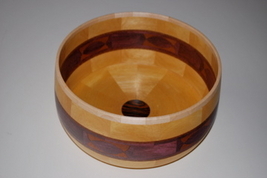 Segemented Bowls are made by taking perfectly fine wood cut it into strips, cut the strips into pie shaped pieces, glue them to shape rings and then stack and glue the rings to form Blanks. It is a lot of pieces and work but the benefit are beautiful designs and far less waste. 10 1/2" diameter by 4"